The singer, songwriter and record producer was honoured for his services to music and charity. The surviving Bee Gee Barry Gibb has been keeping it in the family by getting back on the stage to sing with his brother's daughter. Most people have hummed his catchy falsetto melodies at one time or another. But now the sole surviving Bee Gee, is back on tour. Of course there are no brothers alongside him, but there's a family connection all the same. Click here for dates and more information on the Barry Gibb Mythology Tour. 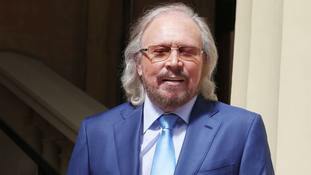 Barry Gibb has made his first visit to England since the funeral of his brother and described how music brought him back from his grief. 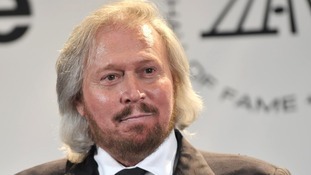 Bee Gees star Barry Gibb will be honoured with a lifetime achievement award at a major music event next month. The Bee Gees' Barry Gibb has described his emotions on going back on the road without his brothers Robin and Maurice by his side. 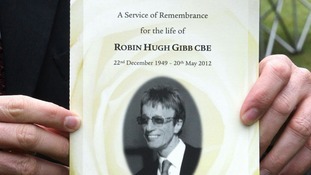 Mourners and well-wishers crowded the streets of Thame today to pay tribute to the 'magnificent' talent of Robin Gibb. 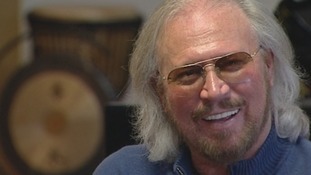 Barry Gibb, the last remaining member of the Bee Gees, has released a video eulogy for his brother Robin. The video, titled Bodding (Robin's childhood nickname), features clips from various stages of Robin's life set to the 1993 Bee Gees ballad Heart Like Mine. 62-year-old Robin died from kidney failure last month and has been buried today in his home town of Thane, in Oxfordshire. Mourners wept as the coffin of Robin Gibb entered the church to the sound of the Bee Gees' hit How Deep Is Your Love. Close relatives, including Robin's widow, Dwina, and his mother followed behind. One woman was so overcome with grief she had to be physically supported as she walked to her seat. This is a very strange experience, having already lost two brothers and now Rob. [...] When you're twins, you're twins all your life. You go through every emotion. And they're finally together. I think the greatest pain for Robin in the past 10 years was losing his twin brother, and I think it did all kinds of things to him. The last remaining member of the Bee Gees trio, Barry Gibb, paid an emotional tribute to his brother Robin's "magnificent mind and beautiful heart" at his funeral today. "Life is too short. In Robin's case, absolutely too short.[...] We should have had 20, 30 years of his magnificent mind and his beautiful heart." "They were both beautiful. And now they are together. They're actually together." Robins Gibb's coffin was carried through the Thame in Oxfordshire in a glass-sided carriage pulled by four black horses. Heading up the procession following his coffin were his two Irish wolf hounds, Ollie and Missy. His wife was comforted by his remaining brother Barry as they walked behind the coffin towards the church, with his two sons RJ and Spencer following closely behind.